A sightseeing tour by bus is a very comfortable way to explore the city. 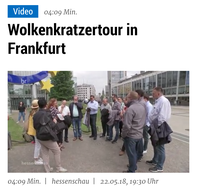 On this tour you will see how many various facets Frankfurt offers. For example the unique skyline, the Museum riverbank or the traditional Apple wine quarter. In case you do not have a bus available, we will support you finding a suitable bus.